The University of Alberta Golden Bears (at left, in white) line up on offence against the University of Calgary Dinos. Canadian football (French: Football canadien) is a form of gridiron football played in Canada in which two teams of 12 players each compete for territorial control of a field of play 110 yards (101 m) long and 65 yards (59 m) wide attempting to advance a pointed prolate spheroid ball into the opposing team's scoring area (end zone). 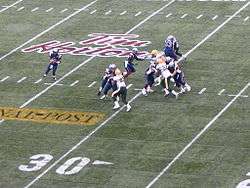 In Canada, the term "football" may refer to Canadian football and American football collectively, or to either sport specifically, depending on context. The two sports have shared origins and are closely related but have significant differences. Rugby football in Canada originated in the early 1860s, and over time, the game known as Canadian football developed. Both the Canadian Football League (CFL), the sport's top professional league, and Football Canada, the governing body for amateur play, trace their roots to 1880 and the founding of the Canadian Rugby Football Union. Active teams such as the Toronto Argonauts and Hamilton Tiger-Cats have similar longevity. The CFL is the most popular and only major professional Canadian football league. Its championship game, the Grey Cup, is one of Canada's largest sporting events, attracting a broad television audience, though it has been shrinking in recent years. In 2009, about 40% of Canada's population watched part of the game; in 2014, it was closer to 33%, peaking at 5.1 million viewers in the fourth quarter. Canadian football is also played at the bantam, high school, junior, collegiate, and semi-professional levels: the Canadian Junior Football League, formed May 8, 1974, and Quebec Junior Football League are leagues for players aged 18–22, many post-secondary institutions compete in Canadian Interuniversity Sport for the Vanier Cup, and senior leagues such as the Alberta Football League have grown in popularity in recent years. 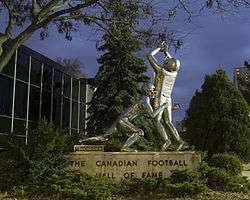 Great achievements in Canadian football are enshrined in the Canadian Football Hall of Fame located in Hamilton, Ontario. The first written account of a game played was on October 15, 1862, on the Montreal Cricket Grounds. It was between the First Battalion Grenadier Guards and the Second Battalion Scots Fusilier Guards resulting in a win by the Grenadier Guards 3 goals, 2 rouges to nothing. In 1864, at Trinity College, Toronto, F. Barlow Cumberland, Frederick A. Bethune, and Christopher Gwynn, one of the founders of Milton, Massachusetts, devised rules based on rugby football. The game gradually gained a following, with the Hamilton Football Club formed on November 3, 1869, (the oldest football club in Canada). Montreal formed a team April 8, 1872, Toronto was formed on October 4, 1873, and the Ottawa FBC on September 20, 1876. The first attempt to establish a proper governing body and adopted the current set of Rugby rules was the Foot Ball Association of Canada, organized on March 24, 1873 followed by the Canadian Rugby Football Union (CRFU) founded June 12, 1880, which included teams from Ontario and Quebec. Later both the Ontario and Quebec Rugby Football Union (ORFU and QRFU) were formed (January 1883), and then the Interprovincial (1907) and Western Interprovincial Football Union (1936) (IRFU and WIFU). The CRFU reorganized into an umbrella organization forming the Canadian Rugby Union (CRU) in 1891. The original forerunners to the current Canadian Football League, was established in 1956 when the IRFU and WIFU formed an umbrella organization, The Canadian Football Council (CFC). And then in 1958 the CFC left The CRFU to become the CFL. The Burnside rules closely resembling American football that were incorporated in 1903 by The ORFU, was an effort to distinguish it from a more rugby-oriented game. The Burnside Rules had teams reduced to 12 men per side, introduced the Snap-Back system, required the offensive team to gain 10 yards on three downs, eliminated the Throw-In from the sidelines, allowed only six men on the line, stated that all goals by kicking were to be worth two points and the opposition was to line up 10 yards from the defenders on all kicks. The rules were an attempt to standardize the rules throughout the country. The CIRFU, QRFU and CRU refused to adopt the new rules at first. Forward passes were not allowed in the Canadian game until 1929, and touchdowns, which had been five points, were increased to six points in 1956, in both cases several decades after the Americans had adopted the same changes. The primary differences between the Canadian and American games stem from rule changes that the American side of the border adopted but the Canadian side did not (originally, both sides had three downs, goal posts on the goal lines and unlimited forward motion, but the American side modified these rules and the Canadians did not). 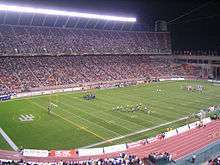 The Canadian field width was one rule that was not based on American rules, as the Canadian game was played in wider fields and stadiums that were not as narrow as the American stadiums. The Grey Cup was established in 1909 after being donated by Albert Grey, 4th Earl Grey, The Governor General of Canada as the championship of teams under the CRU for the Rugby Football Championship of Canada. Initially an amateur competition, it eventually became dominated by professional teams in the 1940s and early 1950s. The Ontario Rugby Football Union, the last amateur organization to compete for the trophy, withdrew from competition in 1954. The move ushered in the modern era of Canadian professional football. Canadian football is played at several levels in Canada; the top league is the professional nine-team Canadian Football League (CFL). The CFL regular season begins in June, and playoffs for the Grey Cup are completed by mid-November. In cities with outdoor stadiums such as Edmonton, Winnipeg, and Regina, low temperatures and icy field conditions can seriously affect the outcome of a game. Amateur football is governed by Football Canada. At the university level, 26 teams play in four conferences under the auspices of U Sports (known from 2001–2016 as Canadian Interuniversity Sport); the CIS champion is awarded the Vanier Cup. Junior football is played by many after high school before joining the university ranks. There are 20 junior teams in three divisions in the Canadian Junior Football League competing for the Canadian Bowl. The Quebec Junior Football League includes teams from Ontario and Quebec who battle for the Manson Cup. Women's football is starting to gain attention in Canada. The first Canadian women's league to begin operations was the Maritime Women's Football League in 2004. The largest women's league is the Western Women's Canadian Football League. 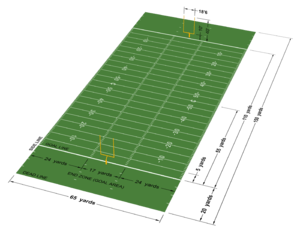 The Canadian football field is 150 yards (137 m) long and 65 yards (59 m) wide, within which the end zones are 20 yards (18 m) deep, and the goal lines are 110 yards (101 m) apart. At each goal line is a set of 40-foot-high (12 m) goalposts, which consist of two uprights joined by an 18 1⁄2-foot-long (5.6 m) crossbar which is 10 feet (3 m) above the goal line. The goalposts may be H-shaped (both posts fixed in the ground) although in the higher-calibre competitions the tuning-fork design (supported by a single curved post behind the goal line, so that each post starts 10 feet (3 m) above the ground) is preferred. The sides of the field are marked by white sidelines, the goal line is marked in white, and white lines are drawn laterally across the field every 5 yards (4.6 m) from the goal line. These lateral lines are called "yard lines" and often marked with the distance in yards from and an arrow pointed toward the nearest goal line. In previous decades, arrows were not used and every yard line was usually marked with the distance to the goal line, including the goal line itself which was marked with a "0"; in most stadiums today, the 10-, 20-, 30-, 40-, and 50-yard lines are marked with numbers, with the goal line sometimes being marked with a "G". The centre (55-yard) line usually is marked with a "C". "Hash marks" are painted in white, parallel to the yardage lines, at 1 yard (0.9 m) intervals, 24 yards (21.9 m) from the sidelines. On fields that have a surrounding running track, such as Molson Stadium and many universities, the end zones are often cut off in the corners to accommodate the track. Until 1986, the end zones were 25 yards (23 m) deep, giving the field an overall length of 160 yards (150 m), and a correspondingly larger cutoff could be required at the corners. This was particularly common among U.S.-based teams during the CFL's American expansion, where few American stadiums were able to accommodate the much longer and noticeably wider CFL field. The end zones in Toronto's BMO Field are only 18 yards instead of 20 yards. At the beginning of a match, an official tosses a coin and allows the captain of the visiting team call heads or tails. The captain of the team winning the coin toss is given the option of having first choice, or of deferring first choice to the other captain. The captain making first choice may either choose a) to kick off or receive the kick and the beginning of the half, or b) which direction of the field to play in. The remaining choice is given to the opposing captain. Before the resumption of play in the second half, the captain that did not have first choice in the first half is given first choice. Teams usually choose to defer, so it is typical for the team that wins the coin toss to kick to begin the first half and receive to begin the second. 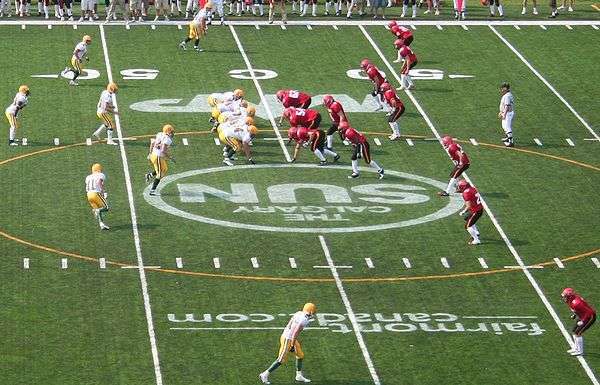 The University of Alberta Golden Bears (yellow and white, offence) are first-and-ten at their 54-yard line against the Calgary Dinos (red and black, defence) in a CIS football game at McMahon Stadium in 2006. The twelve players of each side and the umpire (one of seven officials) are shown. The Golden Bears are in a one-back offence with five receivers. 1 2 3 "Timeline 1860s". Official Site of the Canadian Football League. Canadian Football League. Retrieved 13 July 2010. ↑ "History - CFL.ca - Official Site of the Canadian Football League". CFL.ca. Retrieved 1 December 2014. ↑ "Canadian Football League (CFL)". Encyclopedia Britannica. Retrieved 1 December 2014. ↑ "History - CFL.ca - Official Site of the Canadian Football League". CFL.ca. Archived from the original on 13 December 2014. Retrieved 1 December 2014. 1 2 "History - CFL.ca - Official Site of the Canadian Football League". CFL.ca. Retrieved 1 December 2014.